Manchester United are set to take on Chelsea in the Premier League game on Sunday, 25 February 2018 what should be a massive league game at Old Trafford. United’s have lost the advantage over other top four contendars by dropping points in recent weeks and they might go into the game third in the table if Liverpool win their game against West Ham. Its a must win match for United and Chelsea alike to keep themselves in good shape to qualify for Champions League next season. The game will kickoff at around 14:05 uk time and SkySports has the live coverage in the UK. Only four points separate the second placed United and fifth placed Tottenham which makes it a very exciting scenario for rest of the season as far as top four finish is concerned. United are second with 56 points, Liverpool third with 54, Chelsea are fourth with 53 points and Spurs are fifth with 52 points. A win for United and they will go 6 points clear of third place Chelsea who will be in big trouble to qualify for Champions League. Antonio Conte is more than likely to be axed as Chelsea manager unless they win they champions league and if they lose out on finishing top four, the axe might be earlier than expected. There is also small matter of Mourinho vs Conte rivalry which makes this fixture exciting. 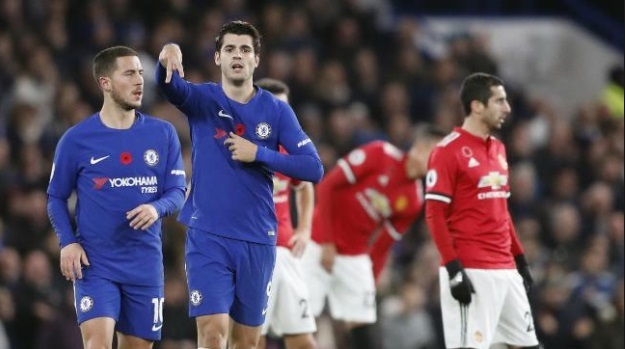 Last time these two meet was back in November 2017 when a solitary goal from Alvaro Morata in second half earned surprising three points for Chelsea. 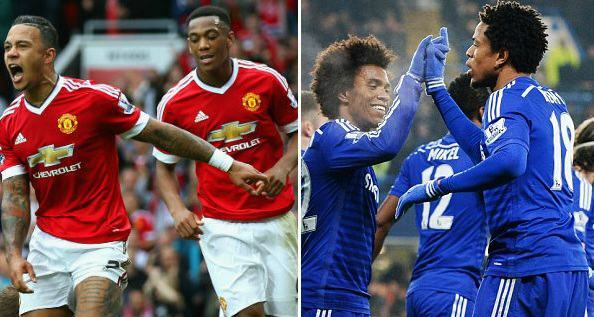 United will be hoping to repeat last season, 2-0 win over Chelsea at Old Trafford. 55′ 1 – 0 Alvaro Morata scores with a thumping header just after the halftime to put Chelsea in lead at Stamford Bridge. 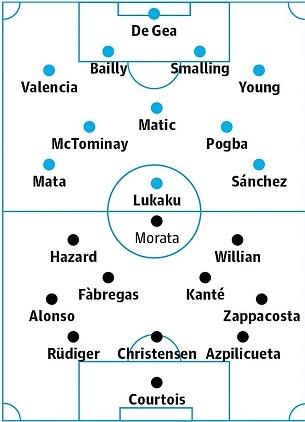 Team News & Lineups: Jose Mourinho has been having trouble with Paul Pogba and how he unsettles the midfield and it will be interesting to see how United lineup. Lukaku is set to keep his place upfront with Sanchez and Martial likely to start on either flank. With Herrera out of the team, United are likely to start with McTomminy, Matic and Pogba in central midfield. Chelsea on the other hand will have Morata back in the squad and should start upfront with Hazard and inform Willian playing in attacking roles. Fabregas and Kante to play in central midfield roles whole Zappacosta and Marcus Alonso to start in wing back roles. Predictions: This one is a huge game for both sides and their chances of finishing in the top four, United still leads the pack by 2 points however anything but a win for United and they will be fighting to keep the top four place. Same can be said for Chelsea who can not afford to lose this Sunday. So we might as well see a 0-0 draw in this one. i am a man utd fan.